It has long been established that vegetables and fruits are an essential part of a healthy lifestyle for children and adults. Evidence has shown that fruit and vegetable consumption may decrease the risk of several serious conditions, including obesity, heart disease, stroke, and certain cancers. The United States Department of Agriculture (USDA) recommends one to two cups of daily fruit consumption for adolescents and children between the ages two and 18. That being said, a 2014 report from the Centers for Disease Control and Prevention found that 60% of children fail to meet USDA fruit intake recommendations. 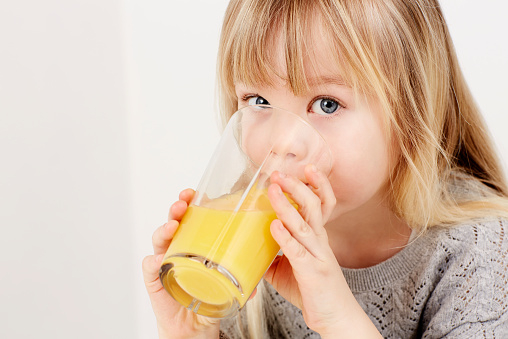 In a new survey, published in the October 2015 edition of the journal Pediatrics, researchers found that while apples are the fruit of choice among children, more than a third of their fruit intake comes from sugary fruit juices. For the study, the researchers examined 2011–2012 data from the National Health and Nutrition Examination Survey, which included 3,129 youth between the ages of two and 19. The survey required the children report all food consumption for a 24-hour period. Using the “What We Eat in America Food Categories” and “Food Patterns Equivalents Database,” the children’s intake from 100% fruit juices, mixed fruit dishes, and whole fruit were calculated. Researchers found that, on average, the children consumed about 1.25 cups of fruit every day. Among the fruit consumption sources, 53% came from whole fruits with nearly 19% of those from apples. Also, 34% of the total fruit intake came from 100% fruit juices. Finally, mixed fruit dishes and juices with low fruit content would amass the remaining 11% of the total fruit consumption. After an analysis of fruit intake by age, researchers found differences in the group of children between the ages of six and 11, and the group between two and five years old. For instance, they discovered that 14.6% of fruit intake was from apples for children between the ages of two and five, but the apple intake was 22.4% for children between the ages of six and 11. However, the older group consumed less apple juice at 8.8% of the total fruit consumption compared with 16.8% for the group between two and five years old. Herrick, K.A., et al., “Fruit Consumption by Youth in the United States,” Pediatrics 2015, doi: 10.1542/peds.2015-1709. Whiteman, H., “Almost a fifth of children’s fruit intake comes from apples,” Medical News Today web site, September 22, 2015; http://www.medicalnewstoday.com/articles/299839.php. “All About the Fruit Group,” USDA ChooseMyPlate.gov web site; http://www.choosemyplate.gov/fruit, last accessed September 23, 2015. Kim, S.A., et al., “Vital Signs: Fruit and Vegetables Intake Among Children – United States, 2003-2010,” Centers for Disease Control and Prevention 2014; 63(31): 671–676.